In early April of 1940, His Girl Friday came to Madison, Wisconsin. It ran opposite Juarez, The Light that Failed, Of Mice and Men, and a re-release of Mamoulian’s Dr. Jekyll and Mr. Hyde. Pinocchio was about to open. Most screenings cost fifteen cents, or $2.21 in today’s currency. Before television and home video, film was a disposable art. Except in big cities, a movie typically played a town for a few days. Programs changed two or three times a week, and double bills assured the public a spate of movies—nearly 700 in 1940 alone. People responded, going to the theatres on average 32 times per year. Given the competition, it’s no surprise that His Girl Friday didn’t stand out in the field; it was nominated for no Academy Awards and honored by no prizes. On just a single day in Madison, the cast of His Girl Friday was up against icons like Muni, Colman, March, and Bette Davis. It would be hard to overstate, I think, the boldness and brilliance of what Hawks has done here: not only an astonishingly funny comedy, but a fulfillment of a whole tradition of comedy—the ur-text of the tough comedy appropriated fully and seamlessly to the spirit and style of screwball romance. His Girl Friday is not only a triumph, but a revelation. Oddly, this extraordinary film lay largely unnoticed for three decades. How did it become a classic? The answer has partly to do with the rising status of Howard Hawks, the director, among critics. It also owes something to changes in how academics thought about film history. And a little movie piracy didn’t hurt. Hawks the Artist is a creation of the 1960s. Before that, American film historians almost completely ignored him. Andrew Sarris often reminds us that he’s absent from Lewis Jacobs’ Rise of the American Film (1939), but he’s also missing from Arthur Knight’s The Liveliest Art (1957), the most popular survey history of its day. Apart from press releases and reviews of individual films, there were few discussions of Hawks in American newspapers and magazines. The most famous piece is probably Manny Farber’s “Underground Movies” of 1957, which treats Hawks along with other hard-boiled directors like Wellman and Mann. From the start, Hawks was more appreciated in France. There film historians acknowledged A Girl in Every Port (1928), in part because of the presence of Louise Brooks, and they usually flagged Scarface (1932) as well, which they could see and Americans couldn’t. (Howard Hughes kept it out of circulation for decades.) But Hawks is barely mentioned in Georges Sadoul’s one-volume Histoire du cinéma mondiale (orig. 1949) and he’s ignored in the 1939-1945 volume of René Jeanne and Charles Ford’s monumentally monotonous Histoire encyclopédique du cinéma (1958). The essay that marked the first phase of reevaulation was evidently Jacques Rivette’s “The Genius of Howard Hawks” in Cahiers du cinéma in 1953. Inspired by Monkey Business, Rivette’s philosophical flights and you-see-it-or-you-don’t tone helped define the auteur tactics identified with Cahiers’s young Turks. Rivette and his colleagues became known as “Hitchcocko-Hawksians.” The essay, however, doesn’t seem to have been immediately influential. Antoine de Baecque claims that within Cahiers, an admiration for Hawks was controversial in a way that liking Hitchcock was not. (1) It took some years for Hawks to ascend to the Pantheon. The story of that ascent has been well-told by Peter Wollen in his essay, “Who the Hell Is Howard Hawks?” In France, the Young Turks’ tastes had been nurtured by Henri Langlois, who showed many Hawks films at the Cinémathèque Française. In New York, Andrew Sarris and Eugene Archer had become intrigued by Cahiers but were ashamed that as Americans they didn’t know Hawks’ work. They persuaded Daniel Talbot to show a dozen Hawks films at his New Yorker Theatre during the first eight months of 1961. The screenings’ success allowed Peter Bogdanovich to convince people at the Museum of Modern Art to arrange a 27-film retrospective for the spring of 1962. The package went on to London and Paris, sowing publications in its wake. For the MoMA retrospective, Hawks granted Bogdanovich a monograph-length interview, which was to be endlessly reprinted and quoted in the years to come. (2) Sarris, now knowing who the hell Hawks was, wrote a career overview for the little magazine, The New York Film Bulletin, and this piece became a two-part essay in the British journal Films and Filming. Both Bogdanovich and Sarris made brief reference to His Girl Friday, as did Peter John Dyer in another 1962 essay, this one for Sight and Sound. At the end of 1962, another British magazine, Movie, published an issue on Hawks. At the start of 1963, Cahiers devoted an issue to him, including an homage by Langlois himself. Thanks to the work of Archer, Bogdanovich, Sarris, and MoMA, Hawks was rediscovered. Sarris provided a condensed case for Hawks in his far-reaching catalogue of American directors, published as an entire issue of Film Culture in spring of 1963. There followed an interview with Hawks’s female performers in the California journal Cinema (late 1963), an appreciation by Lee Russell (aka Peter Wollen) in New Left Review (1964), another Cahiers issue (November 1964), J. C. Missiaen’s slim French volume Howard Hawks (1966), Robin Wood’s Howard Hawks (1968), and Manny Farber’s Artforum essay (1969). There were doubtless other publications and events that I never learned about or have forgotten. In any case, by the time I started grad school in 1970, if you were a film lover, you were clued in to Hawks, and you argued with the benighted souls who preferred Huston. . . even if you hadn’t seen His Girl Friday. One of my obsessions in graduate school was the close analysis of films. But I was also interested in whether one could build generalizations out of those analyses. My initial thinking ran along art-historical lines. My Ph. D. thesis on French Impressionist cinema sought to put the idea of a cinematic group style on a firmer footing, through close description and the tagging of characteristic techniques. But that approach came to seem superficial. I wasn’t satisfied with my dissertation; although it probably captured the filmmakers’ shared conceptions and stylistic choices, I couldn’t offer a very dynamic or principled account of formal continuity or change. Watch a bunch of movies. Can you disengage not only recurring themes and techniques, but principles of construction that filmmakers seem to be following, if only by intuition? As I was finishing my dissertation, reading Russian Formalist literary theory pushed me toward the idea that artists accept, revise, or reject traditional systems of expression. These become tacit norms for what works on audiences. My reading of E. H. Gombrich pushed me further along this path. We should, I thought, be able to make explicit some of those norms. Eventually I would call this perspective a poetics of cinema. I was assembling my own version of some ideas that were circulating at the time. In the early 1970s, several theorists floated the idea that different traditions fostered different approaches to filmic storytelling. People were seeing more experimental and “underground” work, as well as films from Asia and what was then called the Third World. Being exposed to such alternative traditions helped wake us up to the norms we took for granted. The mainstream movie, typified by what Godard called “Hollywood-Mosfilm,” seemed more and more an arbitrary construction. People began examining films not as masterworks or as expressions of an auteur, but as instances of a representational regime. Films became “tutor-texts,” specimens of formal strategies that were at play across genres, studios, periods, and directors. Again, the French pointed the way, particularly Raymond Bellour, Thierry Kuntzel, and Marie-Claire Ropars. At the same moment, Barthes’ S/z was published in English, and it seemed to provide a model for how one might unpick the various strands of a text, either literary or cinematic. Screen magazine was a conduit for many of these ideas in the English-speaking world. At some point in graduate school at the University of Iowa, between fall 1970 and spring 1973, I saw a screening of His Girl Friday. I fell in love with its heedless energy. It seemed to me a perfect example of what Hollywood could do. These niceties didn’t inform my reaction at the time. I was already primed to like Hawks, though, having caught what films I could after reading Wood et al. (During my initial summer in Iowa City, I went to a kiddie matinee of El Dorado and got Nehi Orange spilled down my neck.) 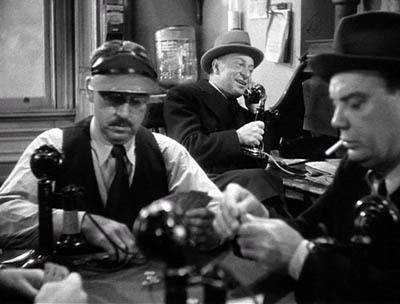 On my first viewing His Girl Friday delighted me with the sheer gusto of the pace and playing. Clearly the cast was having fun. 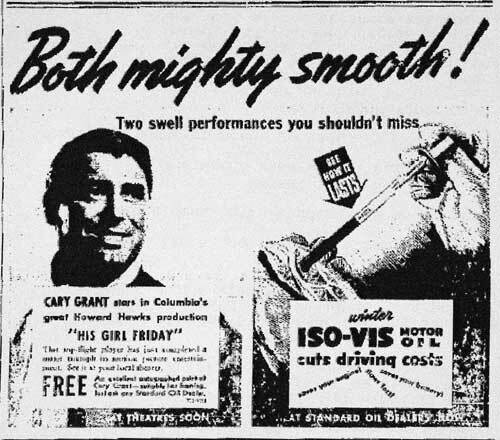 A press release sent out before the film claimed that during one scene, with Cary Grant dictating frantically to Rosalind Russell, she cracked him up by handing over what she had typed. Cary Grant is a ham. Cary Grant is a ham. Now is the time for all good men to quit mugging. You don’t think you can steal this scene, do you—you overgrown Mickey Rooney? The quick brown fox jumps over the studio. Cary Grant is a ham. Even discounting this tale as PR flackery, we know from Todd McCarthy’s excellent biography that Hawks encouraged competitive scene stealing and wily improvisation. Russell hired an advertising copywriter to compose quips she could “spontaneously” conjure up in her duels with Grant. If there was a “classical Hollywood cinema”—a phrase that was in the early ’70s coming into circulation via Screen—the buoyant forcefulness of His Girl Friday embodied it. Here was a film pleasure-machine that hummed with almost frightening precision. What else do you expect from a director who studied engineering and whose middle name is Winchester? When I saw His Girl Friday, little had been written about it. Despite Langlois’ screenings, before the 1962 touring program, the Cahiers critics seemed to have had limited access to Hawks’ prewar work. His Girl Friday wasn’t released theatrically in France until January of 1945 (not perhaps the most propitious moment), and it apparently made no long-lasting impression on the intelligentsia. I can’t find any critical commentary on it in French writing before the 1963 issue of Cahiers. In the United States, HGF earned Hawks a courteous write-up in the New York Times by, of all people, Bosley Crowther, (5) but it wasn’t acknowledged as an instant classic like Mr. Smith Goes to Washington or The Philadelphia Story. After the initial flurry of mostly favorable reviews, the movie seems to have been forgotten until Manny Farber’s 1957 essay, and even there it’s only mentioned in a list. Interestingly, it wasn’t screened during the 1961 New Yorker series. Robin Wood’s sympathetic but not uncritical discussion in his Hawks book of 1968 seems to have been the most comprehensive account available since the movie’s release. At about the time Wood’s book was published, something big happened. 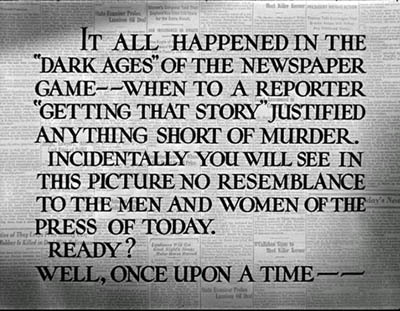 Columbia Pictures failed to renew its copyright, and His Girl Friday fell into the public domain. Entrepreneurs made dupe copies, in quality ranging from okay to terrible. You could rent one for peanuts and buy one for only a little more. Some of these bleary prints have been telecined and turned into the DVD versions of the film that fill bargain bins today. After I got to the University of Wisconsin, where Hawks films stoked the two dozen campus film societies, I bought a public domain print. The copy was better than average, although it lacked the fairy-tale warning title at the start. From 1974 on, I showed the poor thing constantly. In Introduction to Film, taught to hundreds of students each semester, HGF illustrated some basic principles of classical studio construction. It had the characteristic double plotline (work/ romance), a careful layout of space, an alternation of long takes and quick cutting, manipulation of point-of-view, judicious depth framing (see frame below), and cascading deadlines. 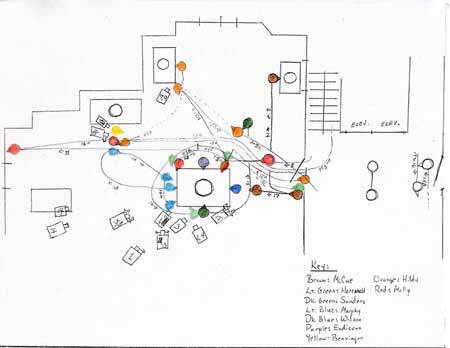 In Critical Film Analysis, I asked students to map out scenes shot by shot (see diagram above) and to show how different approaches (genre-based, feminist, Marxist) would interpret the film. In a seminar on “the classical film and modernist alternatives” HGF grounded comparisons with Bresson, Dreyer, Ozu, Godard, and Straub/Huillet. By steeping ourselves in such alternative traditions, could we resist the naturalness of Hollywood artifice? The movie became a UW staple. It went into the first edition of Film Art (1979) as an instance of classical construction; even the telephones were scrutinized. Marilyn Campbell’s paper from our seminar was published in 1976. (6) Over the years, many of our grad students, exposed to the film in our courses, have gone on to use it in their teaching. I can’t let HGF go. I still use moments to illustrate points in my writing and lectures. Madison colleagues and I swap banter from it; Kristin and I talk in Hawks-code, as she explains here. I’ve been told that grad students in another PhD program compared our program to the Morning Post pressroom (favorably or not, I don’t know). Thanks to Lea Jacobs, the invitation to my retirement party was surmounted by a picture of Walter Burns whinnying into his phone. If he wasn’t crazy before, he would be after ten of those babies got through psychoanalyzing him. Most important of all, TV stations were screening their bootleg prints. HGF didn’t become a perennial like that other public domain classic It’s a Wonderful Life, but its reputation rose. Its availability pushed the official Cahiers/ Movie masterpieces Monkey Business and Man’s Favorite Sport? into a lower rank, where in my view they belong. Once HGF became famous, the proliferation of shoddy prints became an embarrassment. In 1993 it was inducted into the National Film Registry, which gave it priority for Library of Congress preservation. Columbia managed to copyright a new version of the film. A handsomely restored version was released on DVD, and a few years back I saw a 35mm copy whose sparkling beauty takes your breath away. The lesson that sticks with me is this. If Columbia had renewed its copyright on schedule, would this film be so widely admired today? Scholars and the public discovered a masterpiece because they had virtually untrammeled access to it, and perhaps its gray-market status supplied an extra thrill. Thanks mainly to piracy, His Girl Friday was propelled into the canon. In May of 1940, His Girl Friday hung around Madison, shifting from its first venue, the Strand downtown, to an east side screen, the Madison. The film came back in late September to yet a third screen, the Eastwood (now a music venue). 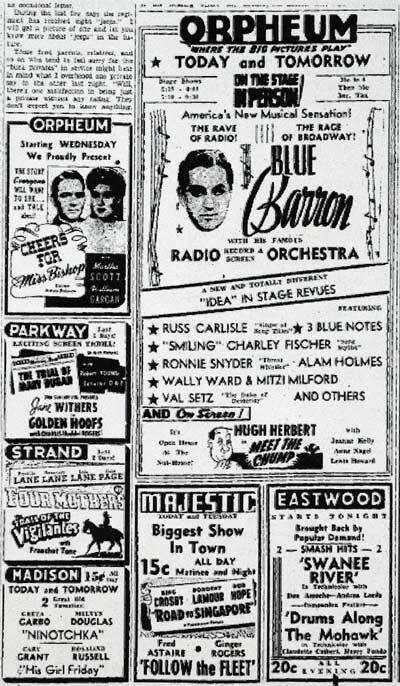 HGF was revived in March of 1941, as the second half of a double bill at the Madison (bottom left below). Check out the competition: some killer re-releases from Ford, Lubitsch, Astaire-Rogers, and Hope-Crosby. A Midwestern city of 60,000 could become its own cinémathèque without knowing it. (1) Antoine de Baecque, Cahiers du cinéma: Histoire d’une revue, vol. 1: À l’assaut du cinéma, 1951-1959 (Paris: Cahiers du cinéma, 1991), 202-204. (2) Bogdanovich has published a much fuller version in Who the Devil Made It? (New York: Knopf, 1997) , 244-378. (3) Thomas Elsaesser, “Why Hollywood?” Monogram no. 1 (April 1971), 2-10; “Tales of Sound and Fury,” Monogram no. 4 (1972), 2-15; Marshall Deutelbaum, “The Structure of the Studio Picture,” Monogram no. 4 (1972), 33-37; Alan Williams, “Narrative Patterns in Only Angels Have Wings,” Quarterly Review of Film Studies 1, 4 (November 1976), 357-372. (4) Jacques Rivette, “Après Agesilas,” Cahiers du cinéma no. 53 (December 1955), 41. (6) Marilyn Campbell, “His Girl Friday: Production for Use,” Wide Angle 1, 2 (Summer 1976), 22-27. For a helpful collection of conversations with the master, see Howard Hawks Interviews, ed. Scott Breivold (Jackson: University of Mississippi Press, 2006). Go here for a 1970s piece by James Monaco on then-current controversies. PS 24 Feb: Jason Mittell responds to my post with some nice nuancing and draws out the implication for copyright issues: contrary to current media policy, the wider availability of a work can actually enhance its value. Coming attraction: Kristin is preparing a blog entry commenting on fair use in the digital age. This entry was posted on Thursday | February 21, 2008 at 9:30 am	and is filed under Directors: Hawks, Film comments, Film criticism, Film history, Film piracy, Film technique: Performance, Film technique: Staging, Hollywood: Artistic traditions, Hollywood: The business, UW Film Studies. Both comments and pings are currently closed.